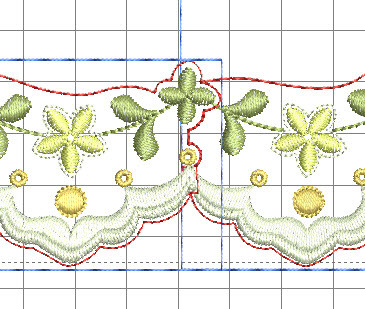 I have been carefully studying and combining these designs so that it is as easy as possible to create scalloped lace which is perfect for lots of projects including sleeve edges, gathered cushion trims and babies dress hems. Firstly I have created 2 versions of GFE_MRN_1_32 and have named them left and right. If you are able to horizontally flip a design in your software or on your machine screen you will not need both versions. Some customers may find it easier to have them individually named and ready to combine. One of the problems I encountered was joining the overlap when positioning the designs on fabric, not in my software. So that there is no loss of strength in the lace at the join and to allow for small errors I have amended the designs so they have a very small tab. May I suggest that you first combine the designs in this manner on fabric without cutting the scalloped edges, unless you are familiar with this procedure. 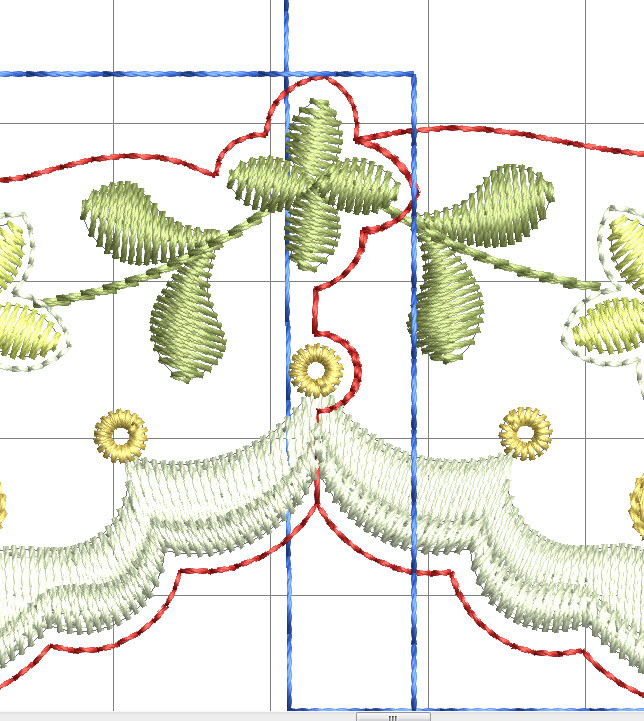 Because this lace has 2 edges of satin stitches it is far easier to create your scallops, as the first ones are in place when you make your trimming and the smaller second ones just tidy it all up! 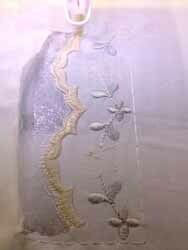 Having made the adjustment and also inserted a stop for cutting the scalloped edge my next experiment was so make the lace using cotton lawn and sheer fabric like tulle and organza. 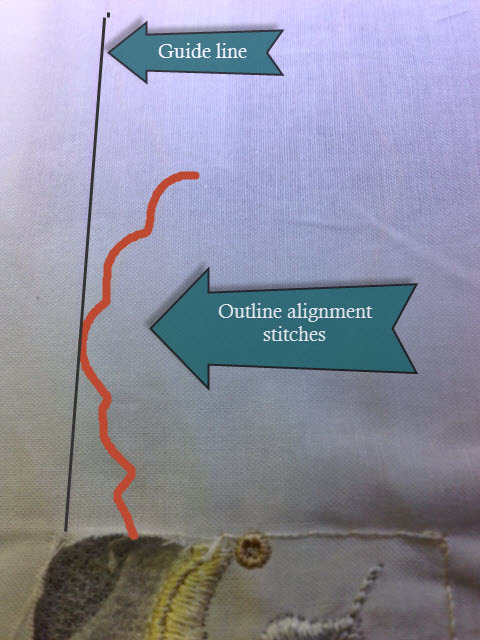 When using the Outline alignment stitches (OAS) remember that were they have been designed to allow you to place another design alongside, so the outline has no gap enabling you to see exactly where the next design should be placed. Now that I have the new Husqvarna Stitch Editor plus, preparing your designs is all the more easier and I think the new method of adding trims so much better and thorough, although never a hundred percent accurate unfortunately. The odd one seems to slip through in conversion. Remember that to make scalloped lace you need to use a soluble stabiliser (or heat away for silk and other non washable fabrics) which can be removed afterwards, but will support the fabric will you are doing the edging! 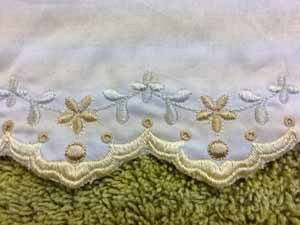 I prepared the fabric and used a marking pen to line my lace against. 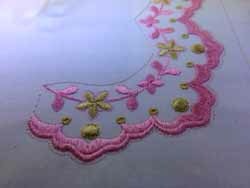 For my stitch out I used a Floranni stabiliser for making free standing lace. I hooped just the stabiliser first in my 4″ x 4″ hoop,and stitched out the first set of Outline alignment stitches (OAS) for GFE_MRN_1_32. To avoid spoiling the stabiliser which should not get wet, or it will start to dissolve I sprayed the temporary adhesive on my cotton lawn so it could be attached easily. You can just see my line on the fabric and the outline underneath. The second set of Outline alignment stitches (OAS) secure the cotton lawn in place. When these are stitched out check the alignment. 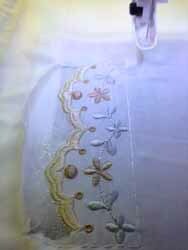 Here are you can see the design stitching out. Trim only the fabric away after the machine stops. Be careful not to cut the stabiliser! 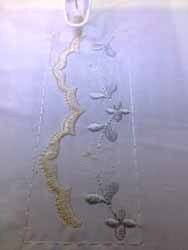 The final edging of satin stitches will tidy up the lace and give it a beautiful edging. I love these pretty colours, pale grey, cream and gold! To add another section of lace to this existing one you will need to take the lace out of the hoop and trim away your excess stabiliser. It may help you to leave the OAS in place. 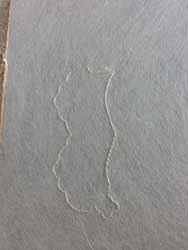 Now hoop up a new piece of soluble stabiliser Stitch out the first set of Outline alignment stitches. 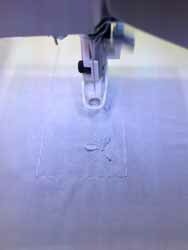 Take your hoop off the machine and spray the underside of the fabric where the next design will be stitched. Then carefully align the fabric onto the hoop making sure that the design is in the correct position. 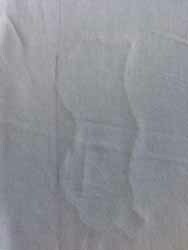 The guide line marked on the fabric and the OAS underneath will help you. 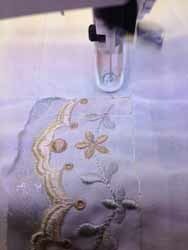 Make sure your fabric is flat and stitch out the 2nd set of OAS. If you find your positioning is out, it won’t take long to unpick them and start again, as they are just long running stitches. If this happens take the hoop off your machine and carefully unpick the 2nd set of OAS. Do not unhoop the stabiliser or unpick the 1st set of OAS. When you are happy with the alignment you can finish off the design, and do as many combinations as you require. Remember to carefully unpick the OAS and trim the stabiliser before washing or removing it with heat. When dry carefully press your lace on the back. If you are worried about any frays or gaps a little Fray Check works wonders. This snapshot from my digitising software shows you how everything should line up! 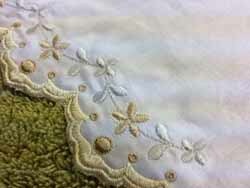 Next time I will share how to create a corner of Marianne lace. If you have already purchased Marianne designs you will receive updated designs in the next few days.